Cougars coach Kalani Sitake says fans should enjoy the rare early-afternoon kickoff because game at Boise State in two weeks will be another late-night affair. 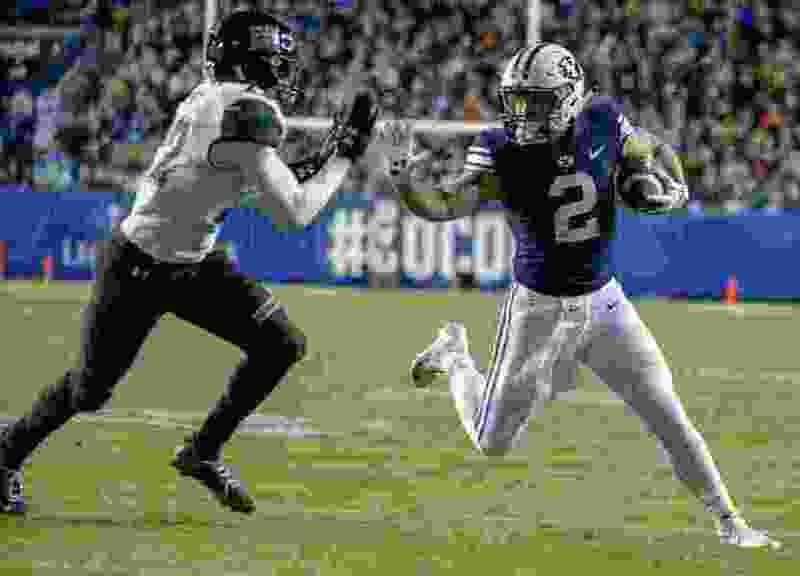 Leah Hogsten | With Matt Hadley leading the way, BYU ran the ball at will against Hawaii two weeks ago, but could find the going more difficult this Saturday against Northern Illinois' stingy defense. Provo • No word yet on whether BYU football coach Kalani Sitake consulted friend and mentor Kyle Whittingham for tips on beating Northern Illinois on Saturday (1:30 p.m., ESPNU) after the Utes downed the Huskies 17-6 the second week of the college football season. But judging from all the good things Sitake had to say about the Mid-American Conference foe during his weekly Monday press briefing, he almost certainly will if he hasn’t already. Both teams are 4-3 and both are coming off byes. Sitake said his team used the time off to get in some extra preparation time, heal up, and get caught up on academics. Also, several coaches hit the recruiting trail over the weekend. BYU also released its new depth chart Monday, and to no one’s surprise freshman Zach Wilson is listed as the starting quarterback. Wilson replaced six-game starter Tanner Mangum two weeks ago and led the Cougars to a 49-23 win over Hawaii. To a man, the Cougars are expecting a tougher time against NIU. “No disrespect to Hawaii or anything like that, but Northern Illinois is going to be a big test for Zach,” said BYU receiver Aleva Hifo. “They have a really good defense. The only losses that they have this season are to Power Five teams [Utah, Iowa and Florida State] and they have played good football up until now. “A lot of people may look down at Northern Illinois just because of whatever reason they feel, but Northern Illinois is a really good football team, and it will be a good test for our offense and a good test for Zach,” Hifo continued. BYU offensive lineman Austin Hoyt said establishing the running attack “is going to be a huge emphasis this week, that lower pad level,” because NIU is so good at stopping the run. With a 1:30 p.m. kickoff time, it will be a rare afternoon start for the Cougars, who have played six of their previous seven games after 4 p.m. Also Monday, the Cougars learned that their Nov. 3 game at Boise State will begin at 8:15 p.m. at Albertsons Stadium. “I am just happy we get to play football,” Sitake said, noting that he doesn’t have a preference on starting times. He might change his mind when temperatures are in the 40s in Boise, Idaho, in early November. BYU’s biggest health question revolves around senior running back Squally Canada, who missed the Hawaii game with a concussion, but also has some nagging lower-leg injuries. Middle linebacker Butch Pau’u is still dealing with a hand injury, and he is now listed as the backup to Sione Takitaki on the two-deep chart. Senior defensive end Corbin Kaufusi appeared at the news conference wearing a big protective brace on his right elbow. Kaufusi downplayed the injury and said he will be ready to play Saturday. He also played some middle linebacker against the Rainbow Warriors, much as he did in the opener against Arizona. Northern Illinois at BYU, 1:30 p.m.